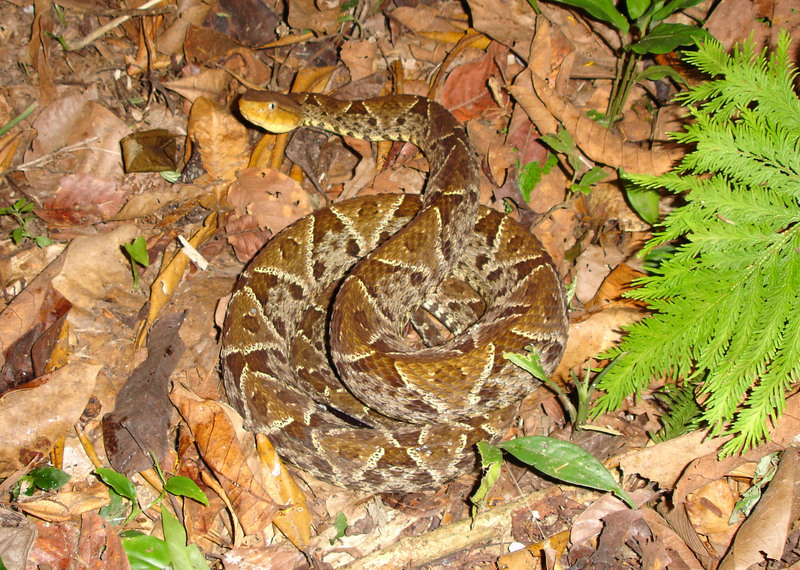 A four foot yellowjaw tommygoff, Bothrops asper, in hunting posture at 2100 hours next to a trail in Cockscomb Basin Wildlife Sanctuary, Belize. Note its raised head posture and alert demeanor. This is the typical hunting posture. Photo by Bob Thomas. The Bothrops asper above slithered away into the bush, and turned to face the intruder. 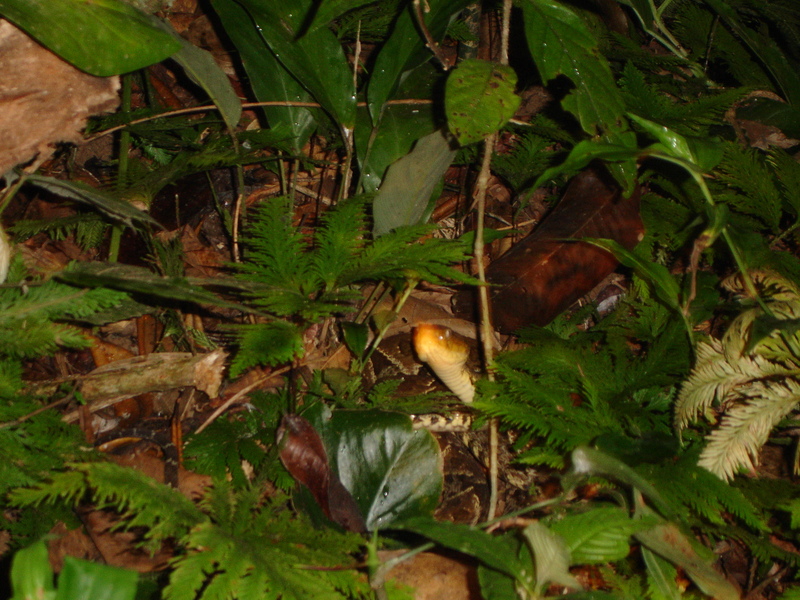 Note the head of the yellowjaw tommygoff exposed above the vegetation. Photo by Bob Thomas. A closer view when the intruder (=herpetologist) cautiously approached the tommygoff. Photo by Bob Thomas. A 0.5 m fer-de-lance, Bothrops atrox, actively hunting after a rain in a moist ditch at the Yasuni Research Station, Yasuni National Park, Amazonian Ecuador. Again, note the alertness and the head held at the ready. Photo by Bob Thomas. Fer-de-lances, also known as yellowjaw tommygoff in Belize, terciopelo in Costa Rica, and mapepire balsain in Trinidad, are normally common where they occur, yet are rarely encountered by humans due to their secretive habits and their incredibly effective camouflaged pattern and coloration. Stories are legion of very close encounters in which the snake remains motionless, innately relying completely on crypsis. Another peculiarity is that human bites are often “dry,” with no venom being injected. That said, these snakes can grow quite large. They have sexual dimorphism in this feature with males averaging much smaller (about 3 feet long) than females (up to 6 feet long or more), the latter infrequently reaching over 8 feet in length. It has been reported that in some places, the females may be 10 times the size of males. This size of the species and the strength and potential volume of their venom makes their presence a constant concern of tropical biologists and all others who enter their habitat. During the day, fer-de-lances tend to remain inactive and reclusive. Yes, they may be found coiled along a trail, even in a phycologist’s hammock, or might be encountered on the move, but our knowledge from ecological studies reveals these are the exception. They tend to prefer to be secreted away in dense vegetation, in burrows or hollow logs, and the like, making it important to proceed in these situations with caution. During the day, they lie in a relaxed coil with their head resting on their back. So when do they become active? Studies have found that they tend to move at dusk from their diurnal retreats to hunting sites frequented by their prey. On the hunting grounds, they assume an alert posture, with the head and neck elevated above the coils. They are obviously attentive to their surroundings and will rapidly strike nearby moving objects. As time passes through the evening, the snakes will leave their hunting sites and often return to the same vicinity they spent the day before, commonly returning to the same hunting site that evening. One would assume fer-de-lances are dangerously aggressive during hunting, and of course they are. But we have encountered them in this posture, even walking by without seeing them until we pass, and have not been bitten. We’ve even noticed them because they flail about aggressively without attempting to bite. They just swell up, strike about, and otherwise intimidate fearful souls! Following this macho display, they normally move off into the bush. But, naturalists beware of another interesting behavior. They often crawl a short distance, stop in a concealed place, and turn to face their foe. An unknowing person who wishes to get a better look may follow the path of movement and quickly receive a strike or two from a defensive snake. Fer-de-lances exhibit another interesting biting behavior. For many venomous snakes, bites on humans occur by a strike from a coiled position – straight out and back. This species is know to strike and miss, and make a successful bite from the victim’s rear as the snake pulls back to its coil. Crypsis may well have come to be in sit-and-wait, ambush hunters, with their camouflaged patterns and shapes being selected for since their prey doesn’t see them as readily, thus giving the predator an advantage. The situation we see in fer-de-lances is a morphological and behavioral combination we see again and again in habitats around the world. In the U.S., excellent examples are copperheads and timber rattlesnakes. A common story is someone stepping or placing hands within inches of these snakes, and eliciting no reaction. There are also stories of this happening, followed by an accidental touch, resulting in several rapid bites before the victim can withdraw. Fer-de-lances are fascinating snakes, and being armed with knowledge of their behaviors and ecology are essential to visitors to their habitats. Eimermacher, Thomas. 2003. Captive care of B. asper. Bulletin of the Alberta Reptile & Amphibians Soc. 16(10): 25-27. Oliveira, M. Ermelinda and Marcio Martins. 2001. When and where to find a pitviper: activity patterns and habitat use of the lancehead, Bothrops atrox, in central Amazonia, Brazil. Herp. Anat. Hist. 8(2): 101-110. Sasa, Mahmood, Dennis K. Wasko, and William W. Lamar. 2009. Natural history of the terciopelo Bothrops asper (Serpentes: Viperidae) in Costa Rica. Toxicon54: 904-922. Solorzano, Alejandro and Luis Cerdas. 1989. 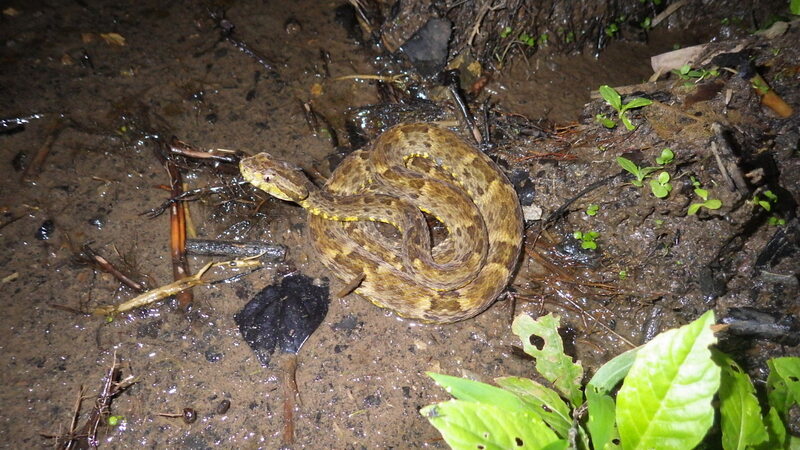 Reproductive biology and distribution of the terciopelo, Bothrops asper Garman (Serpentes: Viperidae), in Costa Rica. Herpetologica 45(4): 444-450. Wasko, Dennis K. and Mahmood Sasa. 2009. 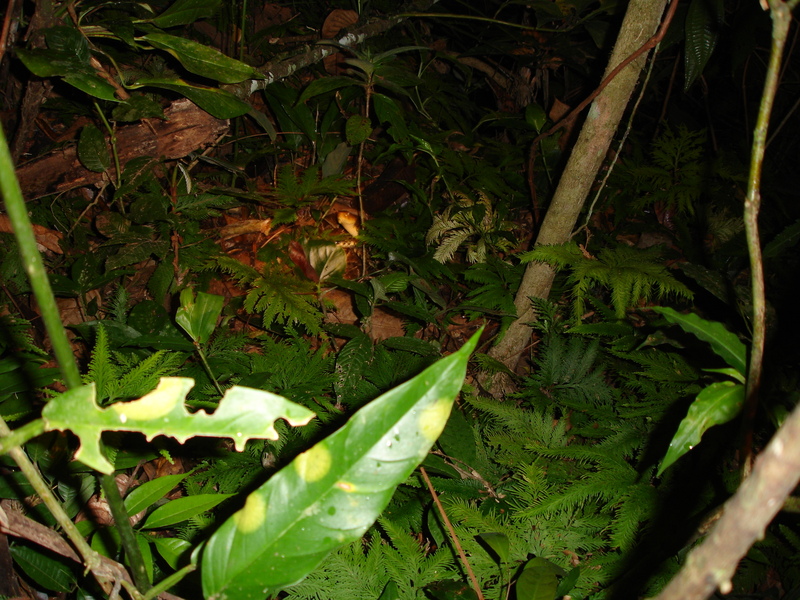 Activity patterns of a Neotropical ambush predator: spatial ecology of the fer-de-lance (Bothrops asper, Serpentes: Viperidae) in costa Rica. Biotropica 41(2): 241-249.